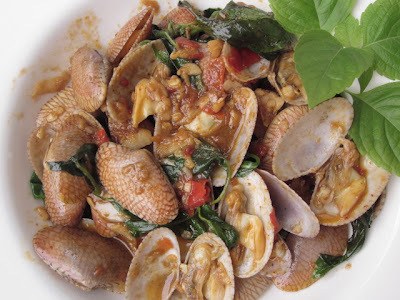 This is one of the greatest seafood dishes I can make with the short time and little ingredients or hassles. The Garlic and Chilli and sweet basil compliment the aroma, while the roasted Thai Chilli Paste ( or Nam Prig pao) with its spice, will excellently execute this most wonderful dish that I only need steamed rice to relish it with. Beat the garlic and the chillies together until become the paste. Fry the paste in 2 tablespoon of vegetable oil with medium heat. When you smell the frying garlic and chilli, put the fresh clams and turn the gas in high flame. 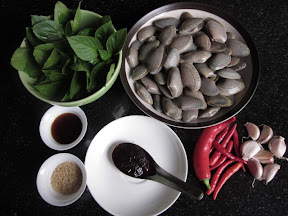 Stir well and season with fish sauce, sugar and chilli paste. Stir fry well, till all the clam is cooked and the sauce thicken and try the taste. When you get the preferred taste, add the sweet basil leave. Serve hot with hot steam rice. PS: I changed the amount of sugar and roasted chilli paste in the last minute and am very happy with the result. I realize Roasted Thai Chili Paste is sweet in itself, there for need little sugar (or not at all) But I increase the Nam Prig Pao instead to get full flavour. I love this dish, hope you like it too.